Leo woman will stand out of the crowd on the street. She normally tall or rather tall. You will hardly see a short thick woman. When she walks she walk like a queen, confident and does not look around, though as if there is no one around her. She will dress in her own style not according to fashion. Leo woman is confident of what she choose to wear. Do not buy cheap cloths where they sell in dozen for her as a gift, she will hate it. Also do not buy cloths that do not reflect her confident personality. She likes unique and strange cloths and accessories. Being different is what she loves. If you want to know her, take times and be patient because she is selective about people she mingles with. She’s open minded, but yet she is not letting people get to close to her easily. She likes sweet words and compliments, but not too much. She smiles with anyone, but inside she thinks she is borne to be a leader. She likes to be in control because it is in her nature instinct. She is a graceful woman, and she has a magnetic charisma, so expect tough competition. She is a very proud person, so do not do anything to challenge her confident. Leo woman can be mad and act like a hurricane, and later can be like an innocent kitten, but do not fall for her O.K. She remembers everything and likes to cherish her sweet memory, so if you find her old photo albums with her ex-boyfriend or love letters that will make you puke, take it easy. Leo woman is keeping her sweet memory does not mean she still in love with the old fool, so you do not have to panic. She will have many guys run after her, so if you have advantage of a good x-udground family, or a famous last name, a successful career then it’s a plus. She hates to be poor and she thinks love will not pay bills. 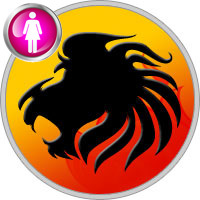 Leo female is a sport type and love sports. If you want to date her, prepare to spend big bugs, for your first dinner with her can not be a hot dog stand, but better be the best place in town. She is a generous person, so do not be surprise if she give you a gift more expensive than what you gave her. She likes extravaganza, no cheap gift, no cheap dinner please. Being poor or broke make her depress. If you do not have lots of money, be creative and make your own gift for her. It’s unique quality and times spending making it for her is a big deal. You can think economical, but do not be cheap.